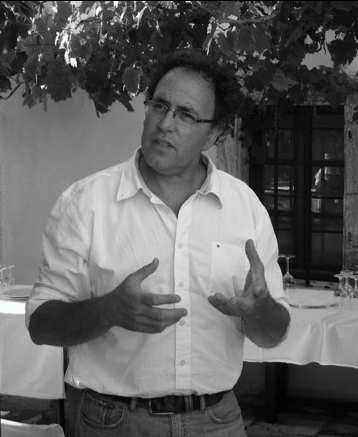 One of Greece’s most artisanal and sought after producers, Yiannis Economou the heart and soul of Domaine Economou the estate, is a vin-de-terroir natural-wine maker of extraordinary ability. With an oenology degree from Alba, years of cellar work in Germany and Bordeaux (Chateau Margaux) as well as Piedmont, under the guidance of Nebbiolo maestros such as Ceretto and Scavino, he returned to Crete in 1994. Upon resurrecting the family vineyards, Yiannis brought his considerable collective wine making experience to bear on the rare native varietals of the high Ziros plateau of eastern Crete. Yiannis treats his wines with a kind of obsessive care rarely seen in modern wine making: selling off lesser vintages when not satisfied with a year, suffering through incredibly low yields rather than chemically treating the vines, and bottling and releasing his wines when he feels they are ready, instead of being dictated by market principles. Indeed, Economou’s previous release was their 2001 Sitia, followed by 2000 and 1998. His current vintage release 1999! The Domaine’s 16 hectare vineyards are located in the villages Ziros, Katsidoni and Etia at 600-650m altitude in what is otherwise known as the Ziros plateau. It is a sparse, ethereal place, a terrior of such a singularly exposed nature (we wore sweaters at night in July) as to lend itself to absolutely lunar comparisons. In its main part, the vineyard is self-cultivated with ungrafted vines of 35 to 70 years old. Cultivation is done with absolute respect to environment in accordance to the high standards of organic agriculture and primarily includes local varieties such as Liatiko, Mandilari, Vilana and Thrapsathiri that produce Sitia’s VQPRD and VLQPRD red and white. Domaine Economou’s red Sitias are made predominately from the local clone of Liatiko, found no where else in Crete let alone Greece or the rest of the Mediterranean. It is a small berried fruit that diverges greatly from other Liatikos in the central and western parts of the island. 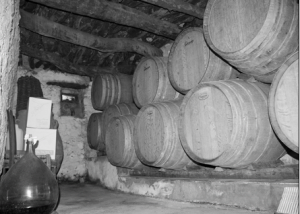 These natural wines undergo only a very low sulphering to stabilize before bottling. They exhibit colors of clear light garnet, tawny brown and brick with an orange/amber rim. Notes of orange peel, herbs and sweet spices form the bouquet. Economou’s whites are made in an oxidative style, allowing the hard-scrabble herbs and stones to show through the honeyed texture wines.